this is a sponsored post written by me on behalf of Loblaws Canada Inc. all opinions are 100% mine. today i am sharing what is one of my go to lunches on weekdays in partnership with Loblaws! while it probably seems like i whip up a fancy pants meal every day of the week, my work keeps me just as busy as the rest of us. i am always looking for fun, healthy & creative ways to mix up a boring old sandwich on sliced bread or even worse fast food when i am short for time. cue: avocado toast! this is a quick recipe idea that you can make in twenty minutes or less. i feel like avocado toast has become quite a trend these days. all you have to do is smash some ripe avocado on bread & boom you've got yourself a meal. it is also a great way to use up any avocados you have that may be on the brink of going bad. i buy them in bulk & it seems like they all ripen at the same time! it's quick, plus avocados are healthy (lots of fiber), full of essential nutrients & taste so good with just a touch of salt! select Loblaws stores have Loblaws Dieticians on hand who can help answer any dietary questions you might have when looking for healthy food alternatives, teach you about the nutrition of different fruits/vegetables & give you some additional quick meal ideas! well, here are two of my versions of avocado toast because as i just mentioned, i always have these bad boys on hand. 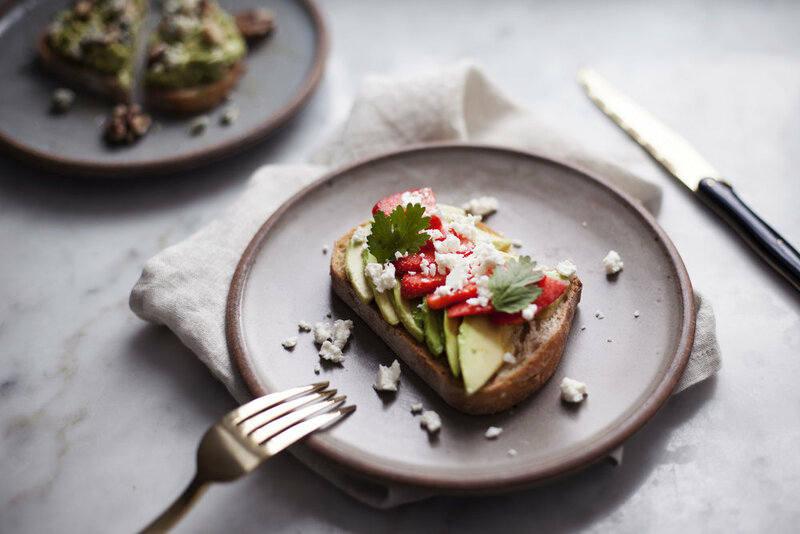 having plenty of fruits + vegetables in your fridge at all times makes it much easier to create a quick & healthy recipe like this avocado toast. you can follow the recipes loosely & substitute in whatever ingredients you find in your fridge or pantry. the possibilities are seriously endless! i have seen so many versions of this. you can even add a touch of lean turkey, chicken, or a poached egg (vegetarian) to the mix if you want to get in some additional protein. what are your 20 minute recipe ideas?! toast bread while you prepare the avocado. in a small mixing bowl, mash avocado with lime juice, salt & pepper. 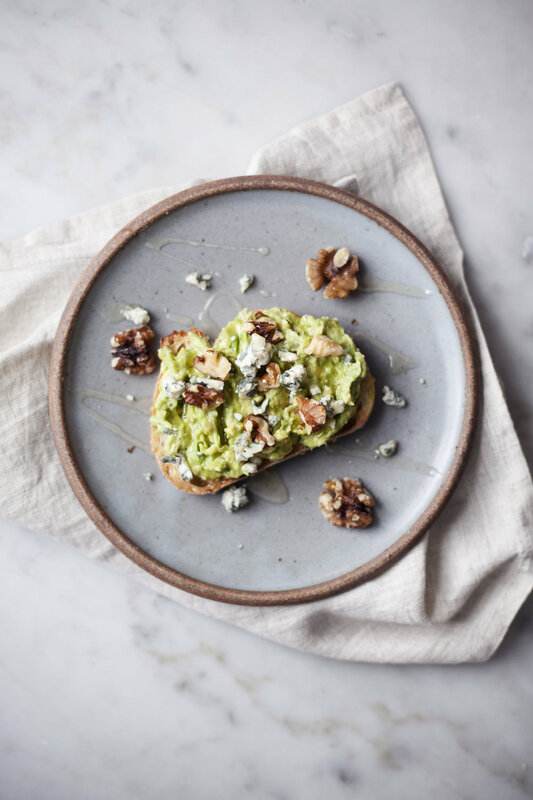 spread evenly over toasted bread & top with crumbled blue cheese + walnuts. 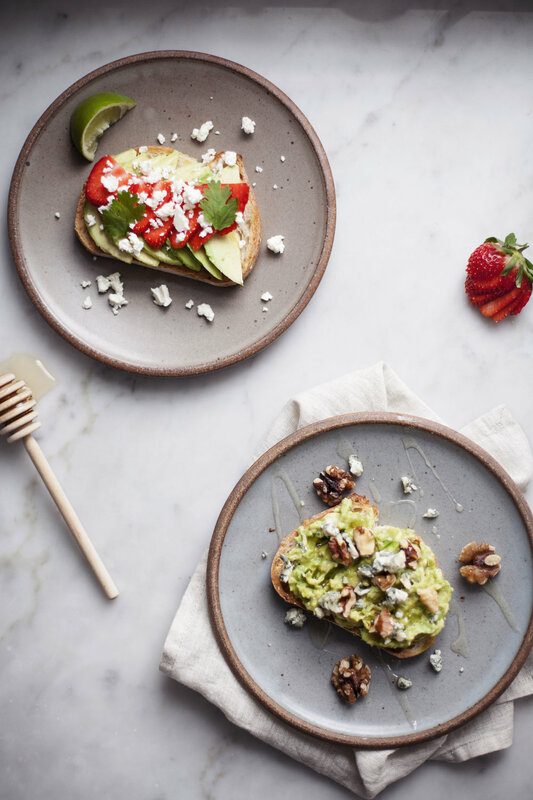 toast bread while you slice avocado & strawberry. top bread with sliced avocado, drizzle with lime juice & sprinkle with salt + pepper. finish with sliced strawberries & crumbled feta.